Welcome card #576 to the Hoard. 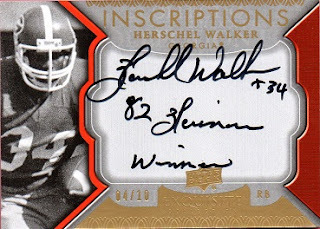 A 2011 Upper Deck Exquisite Inscriptions autographed card of Herschel Walker. 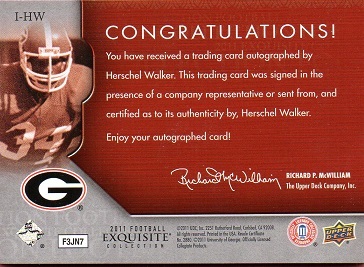 This insert set of the 2011 Exquisite set features 20 former college football greats, who have autographed each card, then added a brief inscription, hence the name. I got into a little bidding war to get this baby, and had to delve into 3 figure territory. I'll justify it by saying there's not many out there, and I wanted to snag it while I could.